Kara McCullough, a 25-year-old chemist working for the U.S. Nuclear Regulatory Commission, was crowned Sunday at the Mandalay Bay Convention Center on the Las Vegas Strip. She will go on to compete on the Miss Universe contest. The runner-up was Miss New Jersey Chhavi Verg, a student at Rutgers University studying marketing and Spanish. The second runner-up was Miss Minnesota Meridith Gould, who is studying apparel retail merchandising at the University of Minnesota. Fifty-one women representing each state and the nation's capital participated in the decades-old competition. McCullough was born in Naples, Italy, and raised in Virginia Beach, Virginia. She said she wants to inspire children to pursue careers in the fields of science, technology, engineering and mathematics. Last year, District of Columbia resident Deshauna Barber became the first-ever military member to win Miss USA. The top five finalists where asked different questions that touched on the pros and cons of social media, women's rights and issues affecting teenagers. McCullough was asked whether she thinks that affordable health care for all U.S. citizens is a right or a privilege. McCullough said it is a privilege. "As a government employee, I'm granted health care and I see firsthand that for one to have health care, you need to have jobs." Later in the competition, the McCullough, Verg and Gould were asked to explain what they consider feminism to be and whether they consider themselves feminists. Miss District of Columbia said she likes to "transpose" the word feminism to "equalism." The beauty pageant this year included five women who immigrated to the U.S. at a young age and now as citizens hoped to represent the nation on a global stage. Verg and the women representing Florida, North Dakota, Hawaii, Connecticut and New Jersey told The Associated Press this week they have faced challenges and opportunities as immigrants. Verg told The Associated Press days ahead of the competition that she and her parents immigrated from India to the U.S. with only $500 in their pockets when she was 4 years old. Her first winter she did not have a winter coat and the family struggled to adjust. "I want to show Americans that the definition of what it means to be American is changing," the 20-year-old said. "It's not just one face. There are many different people who are Americans, and I feel like Asian-Americans often times are left out of the conversation." 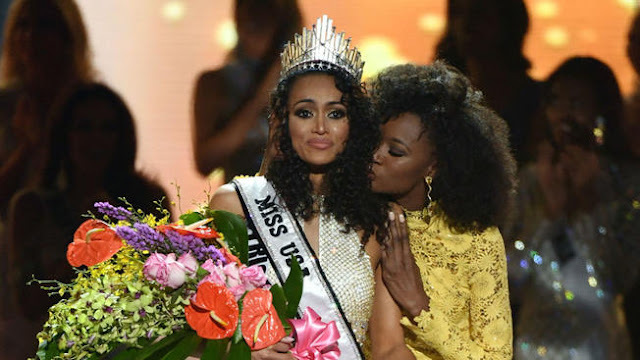 The contestants' remarks stand in stark contrast to the scandal that enveloped the pageant in 2015, when then-part owner and now U.S. President Donald Trump offended Hispanics when he made anti-immigrant remarks in announcing his bid for the White House. Trump co-owned The Miss Universe Organization with NBCUniversal, but the network and the Spanish-language broadcaster Univision quickly cut ties with him, refusing to air the show. Trump sued both networks, eventually settling and selling the pageant to talent management company WME/IMG. The show kicked off with a performance from a Cirque du Soleil show — a Las Vegas staple — based on Michael Jackson songs. The contestants took the stage as Jackson's "Black or White" played and acrobats performed. CMA Award-winner Brett Eldredge performed his new single "The Long Way" as the women modeled their evening gowns. They modeled their final looks of the night during a performance of Pitbull's "Options" featuring Stephen Marley. Julianne Hough, Ashley Graham and Terrence J. hosted the show.